Your membership certainly represents more than just the check you write. Your annual household membership supports our many initiatives, services, and activities listed below that benefit each of us – sometimes in ways you may not even be aware. And, most importantly, your active participation helps to ensure the vitality, strength, safety, and success of our neighborhood. WE NEED YOU – and your enthusiasm, ideas, creativity, and concern! Put your membership in action! · The Lakewood Heights Neighborhood Association represents YOU! LHNA officers and street reps are your direct connection to City Hall and the Dallas Police. They reinforce your own reporting of problems, often contacting department heads and council members directly to get action. Your annual membership dues also helps our participation in the Dallas Homeowners League's meetings and Boot Camp workshops to keep abreast of city-wide neighborhood issues and causes, and to gain info and techniques for running the neighborhood and interacting with city departments. Through the work of the Association, Lakewood Heights enjoys a history of having a strong relationship and voice at City Hall and in making things happen for the neighborhood! · The Heights Herald Newsletter – Written and published by LHNA, the quarterly newsletter is hand delivered to every residence in Lakewood Heights –about 1150 – by your street rep and/or block captain to help make sure everyone gets info they need. It brings you news and updates regarding upcoming meetings and events, park updates, code issues, crime watch concerns and prevention, general interest articles, local school issues, and general neighborhood news. Costs are paid by your dues and advertisements. We encourage all creative writers to offer topics and/or articles! We really appreciate all volunteers who deliver it and our benefactors who offer advertising support! If you have a business, we LOVE promoting our own neighbors – let us know how we can help! · The LHNA Website & Neighborhood-based Social Media – The website is under construction again! It will keep you current with the latest newsletter, hot topics, and great links to City of Dallas web pages. For those talented neighbors who are website gurus with creative talents, we can always use help keeping everything updated and working smoothly. Lakewood Heights neighbors also join in discussions in local social media blogs, such as Nextdoor. · Quarterly General Meetings of LHNA Members – Meet your neighbors and share ideas and concerns! Hear guest speakers and gain valuable information! We often schedule meetings in fun neighborhood locations! · Monthly Board Meetings – includes the Officers, your Street Captains, committee leaders, and any interested member to discuss and solve issues that arise, as well as plan events and programs. · LHNA Email Contact List & Facebook Page – Email updates are a special benefit of membership! LHNA also has a Facebook page! Like us and get the latest updates and discussions with neighbors! Get current updates & reminders about events, news, crime watches, any crime alerts, and emergencies. · The Lakewood Heights Day – weekend near Sept 20– Picnic at Tietze Park, celebrating 100+ years of neighborhood history! · LHNA Front Yard Picnics – Each Lakewood Heights street hosts a front yard picnic when neighbors gather for a fun event to get to know each other. Generally in late spring or early summer, neighbors on each street organize and decide what to do each year. Simple or elaborate, hundreds of neighbors enjoy the picnics every year! 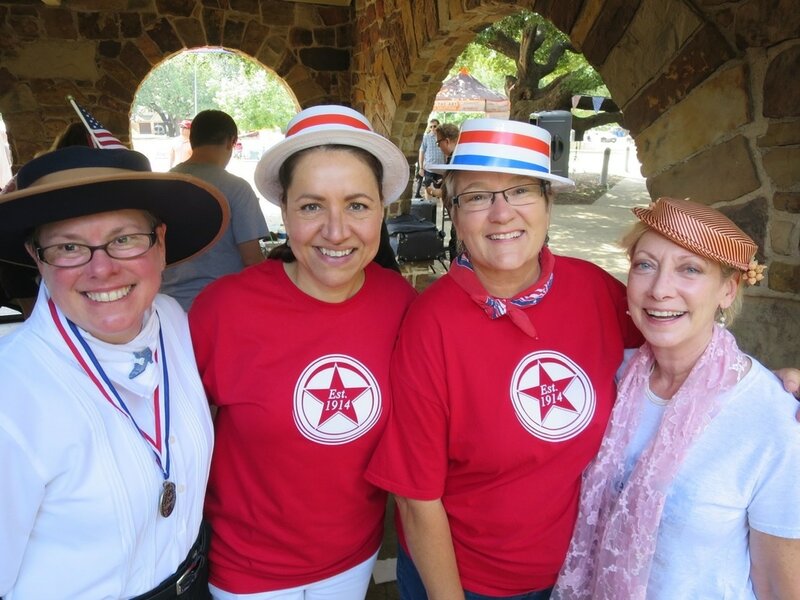 · National Night Out – Lakewood Heights teams with our adjacent neighborhood associations to plan and host one of Dallas’ largest National Night Out picnics! Held the first Tuesday in October in Tietze Park, this event draws hundreds of neighbors and exhibitors, food and fun to celebrate the services of our police officers, fire & emergency personnel, and to learn all-important safety & health information. This is an incredible evening of festivities!! Watch for announcements in the LHNA newsletter in September. · Pumpkins in the Park – A Fall favorite near the end of October in Tietze Park! Join the fun of pumpkin carving and decorating. The LHNA pumpkin crew cleans out the pumpkins the night before for good, clean fun at the picnic! We often throw in a chili cook-off and bake-off for fun prizes offered through donations from our area merchants! We also conduct our October General Meeting during the picnic and have guest speakers each year. · Teaming with the Friends of Tietze Park Foundation – Expanding on our decades of stewardship of Tieze Park, LHNA established the FOTPF LHNA to broaden the effort and ensure continued improvements at our neighborhood gem: Tietze park! Lakewood Heights joins FOTPF in several cooperative efforts to bring park lovers together to help with clean-up and maintenance, graffiti, minor repairs, painting, tree planting, playground and beautification projects, and fun events like Tietze Splash! · Neighborhood Outreach Programs – Partnering with organizations, churches, and businesses, we seek to provide volunteer opportunities to benefit neighbors most in need, and work with local groups to help others. Current effort is our ADOPT-A-Fire Station Program to construct a volunteer community-build shade structure for our first responders at the Station 17 Fire House. · Community Thanksgiving Potluck Dinner – Held on the Tuesday before Thanksgiving at Skillman Church of Christ, adjacent to the park, LHNA and SCOC serve the turkey and ham, while everyone brings their favorite side dish to share! This is a wonderful evening of neighbors celebrating Thanksgiving and our close ties with each other! · Committees help to address concerns to get action: Something for everyone! 1. Membership – Works with the Treasurer and Secretary in keeping up-to-date records and dues. 2. Communications – prepares the Heights Herald Newsletter; graphic arts-signs, banners, fliers; Newsletter advertising; Web site-updates and development; LHNA Email Network updates and email news. 3. Crime Watch – organizes crime watch group, coordinates and builds relationships with Dallas Police divisions; works with Street Reps to help organize National Night Out events. Sends Crime Watch emails to members. Includes Emergency Preparedness Plan updates and coordination. 4. Events – Plans, organizes, and conducts neighborhood events, working with other committee members for particular efforts. 5. Fund Raising – Builds, maintains strong relationships with area businesses, organizations, and individuals to help raise funds for neighborhood needs. We need your expertise and help with fund raising! 6. Neighborhood Services – trash and debris pick up, recycling, streets, street lighting, and utility service to the neighborhood. Seeks ways to help neighbors in need to adequately maintain their property. Includes Emergency Preparedness Plan updates and coordination. Helps in supporting our local Fire Station 17. 7. Zoning– issues regarding requests for zoning changes in LH or areas affecting LH. Works closely with DHL and the city. 8. Traffic – monitors and reports traffic problems, coordinates with the city and DPD for improvements.